A special customized 2012 Street Glide® motorcycle will be the featured prize of the Harley-Davidson 2012 Daytona Bike Week Motorcycle Raffle to benefit the Muscular Dystrophy Association (MDA). 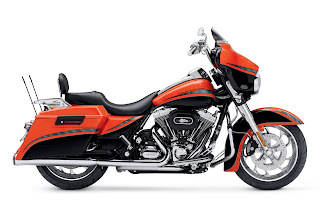 Created just for this event by the Harley-Davidson Genuine Motor Accessories® department, the Street Glide has been decked out with a Tango Limited Series Custom Paint Set, Blade Custom Wheels, a Wind Splitter Windshield, a Boom! Audio Premium Speaker Kit, a Bat Wing Ape Handlebar, a Chrome Front End Kit, a Rallyrunner® Seat, a Screamin' Eagle® Ventilator Air Cleaner Kit, Screamin' Eagle Nightstick Mufflers and many more accessories. The combined retail value of accessories installed on the bike is more than $14,000. The total customized motorcycle has a fair market value of approximately $35,600 US MSRP. Raffle tickets to win the bike will be available at the MDA booth at the Harley-Davidson exhibit at Riverfront Park on Beach Street in Daytona Beach, Fla. Raffle tickets are $5 per ticket or five tickets for $20. Ticket sales start Saturday, March 10, and end at 2 p.m. March 17, when the drawing will take place. The winner does need not be present to win. All proceeds will benefit MDA. Since 1980, Harley-Davidson's family of dealers, customers, employees, suppliers and H.O.G. (Harley Owners Group) chapters has raised more than $81 million for the MDA. From the donations these rides and other special events raise, they support MDA worldwide research efforts, comprehensive medical care for children and adults with neuromuscular diseases, the MDA summer camp program for youngsters and more.